Our FBO is committed to providing a superior level of customer service. We offer preferred rates with several local businesses, including hotels and rental car companies (for your convenience, rental cars can be delivered and returned to our FBO). We will be happy to make any necessary reservations for passengers and/or crew when given the details of your stay. We can also provide catering for flight crew and/or passengers, and can accommodate full sit-down meals in our passenger lounge. 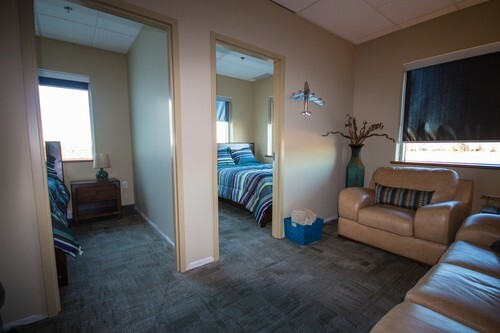 Upon arriving at our facility you will be greeted in our comfortable reception area complete with fireplace and breakfast nook, which offers fresh pastries and hot coffee as well as complimentary Nestle treats any hour of the day. Our full-service flight planning room allows us to cater to all pilot requirements ranging from quick-stops to long stopovers. Our facility is now the ONLY provider of 100LL Aviation Gas on the airfield. In anticipation of your needs, we are proud to offer a pilot’s snooze room and full Crew lounge which can accommodate up to 30 people. You can enjoy our 55” flat-screen televisions along with satellite and Blu-Ray player while you are with us. For our catered meals, we are pleased to offer a variety of boxed lunches, which could include sandwiches, soup or salad, fruit, and beverage as well as a variety of hot entrées, all prepared for ease of transport on aircraft or a vehicle. We will also gladly meet your dining needs here at our FBO with fully functioning kitchen, and will provide catered meals prepared fresh on site when requested by a client. 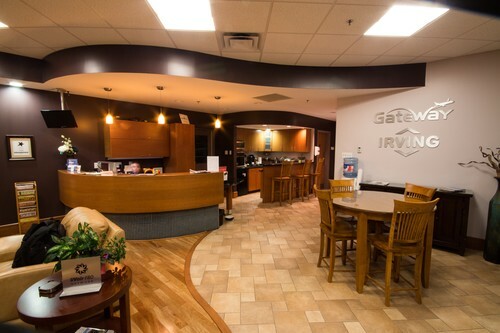 We can accommodate all types of dietary restrictions, and can provide catering menus in advance – just ask one of our FBO staff for more information. Although we can generally have catering available for you with just a few hours notice, it is always nice to have as much notice as possible so that we can provide the most efficient service. Here at Gateway we have ample ramp parking available for any size aircraft, including two gates that can accommodate a B757 and B747-400F simultaneously while still allowing plenty of space for cargo and ground handling operations. 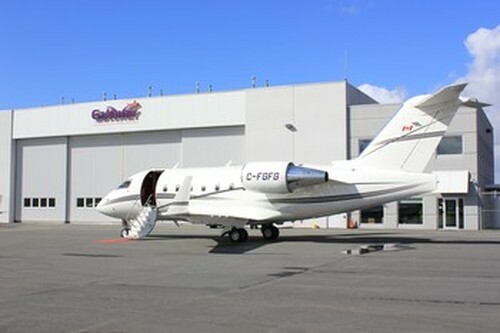 We also have a 13,000 square foot heated hangar with sliding doors that can accommodate aircraft sizes up to a Bombardier RJ-200. When fully open, the hangar doors leave an opening 80ft wide by 26ft high. Our hangar is ideal for medevac, air ambulance or VIP flights because it can safely accommodate the aircraft and necessary transport vehicle in the hangar simultaneously, which eliminates any outside variables that could be detrimental to the health and well-being of the client. We are located only one minute’s drive from the Holiday Inn Express and Hilton Garden Inn Airport locations, and will gladly take you in our shuttle vehicle to any of these hotels for your stay. Please note, we have a special rate at the Holiday Inn Express and Hilton Garden Inn. We also have a discounted rate at a variety of hotels in the downtown area, which is located approximately 25 minute drive from our facility. If you would like more information about hotels we recommend, please be sure to contact us for a list of discounted prices and contact information.